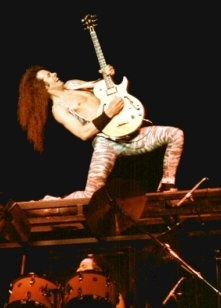 Many years ago on a hot July night I went to see a Ted Nugent concert at the Poplar Creek Music Theatre in Hoffman Estates, Illinois, along with Ted Nugent's mother, Ma Nugent, and my girlfriend at the time, Lynn. We picked up Ma and went to grab a bite to eat at a local restaurant. On the way there we heard a news radio broadcast announce that Ted's $60,000 Ford Bronco had been stolen from his Michigan ranch. Distraught over the pending outcome, we were in a hurry to get to the show to meet with Ted to find out what he knew of the developing disaster. Arriving on time we quickly headed backstage where Ted revealed that he already knew about the stolen vehicle and that his Michigan law enforcement friends were helping locate the missing truck, he said:“ they are out looking for the treasured custom all-terrain mud swamp vehicle." Not much else was said after that. The show was to stampede on! We retired to our audience seats where Ma handed Lynn and I each a set of ear plugs; regretfully I turned them down, though Lynn accepted them graciously. The night air was warm and the crowd was anxiously anticipating the arrival of Ted to the stage, though we had to suffer the opening acts Yngwie Malmsteen, playing along with 'tapes' of a band, and at the time, a relatively unknown Jon Bon Jovi. As the moments ticked down to the pending arrival of Ted to the stage I prepared Lynn for what she was about to see. She had no idea what Ted's shows were like, or that his music created a flutter, even within the calmest of hearts. She was, after all, a vegetarian, and already had a preconceived notion of what she thought he and his music was all about. The lights went down and a scorching guitar solo began to scream from the massive P.A. system of the Poplar Creek Music Theatre. Suddenly a follow spot appeared as Ted was high upon a scaffolding above the drum kit, head tilted backward and hair flailing in the wind in a wild rock God frenzy. He was frighteningly close to the top row of the theatre lights just above. It was at that moment, from either side of me both of my arms were being grabbed, Ma to my right, and Lynn to my left, a sudden moment of clinched madness came over them! It was hard not to be affected by the shear excitement Ted generated as he opened with a blazing version of 'Stranglehold', Lynn pushed her mouth to my ear in the loudness of the tirade and said to me, 'he's beautiful'. Ma continued to clinch my arm and was biting her lower lip with obvious pride, shaking her head in a continuous expression of her overwhelming emotions. The stage was officially set afire! The band which Ted had at the time included singer Brian Howe (formerly of Bad Co.). They went on to peg every Ted Nugent classic with a fever that seemed to rise throughout the night. Ted seemed better with every scorching guitar solo and every primal scream. His music roared through the theatre as if there were something pulling it to previously un-scaled heights. Afterwards we retired backstage for the usual banter, etc. Lynn seemed to turn an about-face that evening after realizing that Ted Nugent and his mother were genuine and ultimately special people. After all they were my friends and she was my girlfriend. Did she have a choice? Not! Though her final acceptance was reassuring. Ted kissed her on the hand and took her breathe away for a moment. She was now officially a fan! When all was quiet and others were engaged in trivial conversations, I took a stroll out onto the stage, which looked due south. As I recall it was close to midnight and the stage was practically empty, with some crew members still clearing away last-minute gear. As I strolled about the stage I tried hard not to get in the way, but I wanted to feel the coals after the fire of Ted's show had died down. As I calmly walked to the stage's center, I thought to myself that it was strangely bright out for being so late at night; I looked up beyond the horizon of the theatre’s seats. Perched up in the sky was a blazing full moon. I tucked my hands into my blue jean pockets and said to myself, "Ah, ha, that's what Ted was seeing all night long. It was to clear to me now, where the fire came from'. After seeing Ted in concert many times before that night, and many times to follow, it became increasingly apparent to me that he often sees that full moon virtually every time he performs, as if it were somewhere beyond the audience, and that he has never stopped seeing it since. If you ever go to see a TN concert you will know what I mean. I still live with that memory, and often think of that night as an inspiration to follow my own full moon.